By buying this product you can collect up to 27440 bonuspoints. Ellok klass E44 typ DRG, loket har mfx digitaldekoder, högeffektsdrivning, ljudmodul, kan köras i både AC och DC, 2 kraftfulla motorer, drivning på 2 axlar, LED lampor, separat monterade detaljer, längd över buffertar 47,8 cm, epok III. Model: The locomotive is constructed of metal with applied plastic parts. It has an mfx digital decoder, controlled high-efficiency propulsion, and a sound effects generator. The locomotive can be operated with AC, DC, Märklin Digital, and DCC. It has 2 powerful motors. 2 axles powered. The locomotive has warm white LED headlights that will work in conventional operation and can be controlled digitally. The wheel treads have been refined. The locomotive has digitally controlled Telex couplers that can be replaced by reproduction prototype couplers. Reproduction prototype couplers are included with the locomotive. The engineer's cabs have interior details, interior lighting that can be controlled, and doors that can be opened. The locomotive has separately applied metal grab irons. It also has sprung buffers. 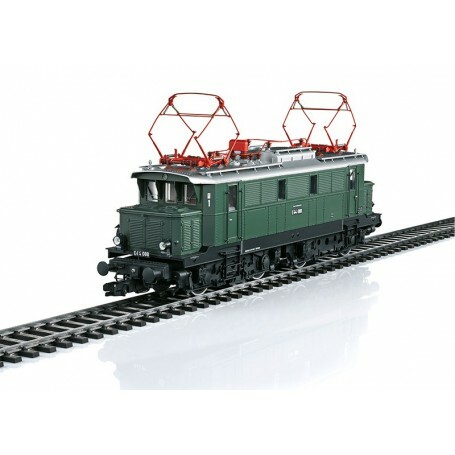 Different sound functions can be activated such as the locomotive whistle, running sound, compressed air being released, and the clicking of the relay. Minimum radius for operation 600 mm / 23-5/8'. Length over the buffers 47.8 cm / 18-13/16'. Prototype: German Federal Railroad (DB) class E 44 passenger locomotive. The locomotive looks as it did around 1959 in the 'Bottle Green' basic paint scheme. Road number E 44 088, Bw Bamberg, Nurnberg District, assigned to Bamberg. The German State Railroad (DRG) had a great success with the E 44. This locomotive had power trucks but no pilot wheels and quickly developed into an 'All Purpose Weapon' that turned in the best results in light and medium duty service. This did not change on DB up to the start of the Sixties. This model of road number E 44 088 from the Bamberg maintenance facility is presented in the prime of its years, namely as it looked in the 'Bottle Green' basic paint scheme around 1959.